Truffle Haiku: The People's Turn to Choose! Contributor Jim Dixon of RealGoodFood has been a big influence on me, especially when it comes to root vegetables. Growing up in a family where a can of creamed corn qualified as a vegetable, it's been refreshing to get comfortable with these ultimate comfort foods. Below you'll find Jim's recipes for a celery root and sweet potato gratin and one for creamed kale, both of which I've been working on here at home (a photo of my dish using kale, above; recipe to come). Great minds think alike! 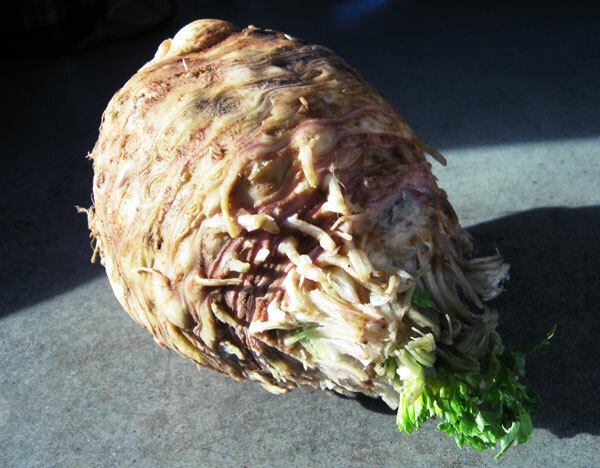 Celery root looks awful and requires serious (but easy) paring to get to the good stuff, and the results are worth the effort. I’ve used a swivel peeler, but I think the best approach is slicing away the exterior with a chef’s knife. The root end holds a lot of dirt, and while I’ve carved around the crevasses, these days I don’t try so hard to save every little morsel. However you choose to attack the thing, you want to end up with mostly creamy looking interior. Cut into chunks. Add a generous pour of olive oil (start with a few tablespoons or so; add more if it seems dry), a few shakes of pimenton (smoked paprika from Spain), and salt. Spread into a baking dish, top with bread crumbs, and bake at 350° until nicely browned. 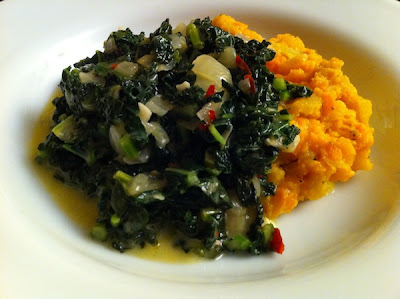 Inspired by the way Jason French cooks this at Ned Ludd, I’ve been making creamed greens for the past few weeks. I’m pretty sure Jason’s have some pork parts, but I kept things a little more simple. A splash of fish sauce provides an extra hit of umami. At Ned Ludd the greens go on brioche toasted in the wood oven; at my house (and for the ski weekend) it’s New Seasons’ wheat levain. Chiffonade a bunch of collards by rolling several leaves in a tight bundle, then slicing across the stem into half inch ribbons. Cut these into slightly shorter pieces. Chop an onion and cook it in a bit of olive oil for a few minutes. Add the greens, a shot of fish sauce (maybe a tablespoon or so), and maybe a half cup of water. Cover, reduce heat to a simmer, and cook for at least 40 minutes. When the greens are very tender, remove the lid, add about a half cup of cream (or creme fraiche), bump up the heat to medium, and let them cream bubble away gently for another 15 minutes or so. Serve over root vegetable gratin (recipe above) or toast or, if you don’t want to use a knife and fork, cut the bread into cubes and put the creamy greens on top.